In the midst of the currency war controversy, there is one emerging market country that continues to insist that its currency is undervalued: Russia. While being a member of the illustrious group of BRIC (Brazil / Russia / India / China) countries would seem to guarantee an appreciating currency, there are strong forces weighing on the Ruble. In other words, that it remains weak is not due to investor oversight. If you view the performance of the Russian Ruble over the last few years, it’s clear that it never recovered from the rapid depreciation that took place during the height of the credit crisis. Given that nearly every other emerging market currency is either closing in on or has already breached its pre-credit crisis level, there must be something holding down the Ruble. That something happens to be a sizable current account deficit. Unlike with other emerging markets, capital is actually flowing out of Russia. There are a few reasons for this: first of all, much of Russia’s debt is denominated in foreign currency, as a consequence of its massive default in 1998. Specifically, “The private sector has about $16 billion in foreign debt, including interest-rate payments, due this month [December], double the $8 billion of redemptions in October and November.” This means that every month, Russian companies must scramble to exchange Rubles for Dollars and Euros. Next, the real returns of investing in Russia are currently negative. Russia’s Central Bank (Bank Rossii) continues to maintain the benchmark refinancing rate at a record-low 7.75%, and the 10-year yield on Russian bonds is even lower, at ~5%. This would seem to compare favorably with the 2.75% yield on comparable US Treasury Securities until you account for inflation, which is projected to top 8% for the year. 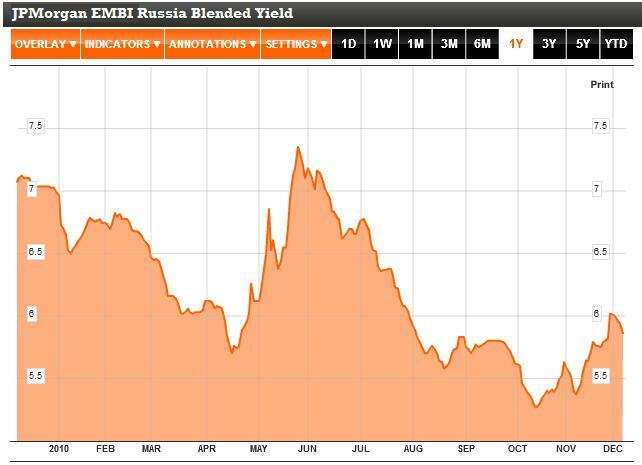 While Ruble-denominated bonds pay a higher interest rate (7.75%), they also carry higher risk. For that reason, Russian yields and credit default swap spreads (which insure against default) are much higher in Russia than in other BRIC countries. As a result, Bank Rossii finds itself in a somewhat unique position among Central Banks of having to try to prop up its currency. Technically, the Rouble is pegged to a basket (consisting of 55% Dollars and 45% Euros), but pressure on it has been so intense that the range in which it is permitted to trade has been adjusted downward five times since the middle of October. To prevent it from declining further, Bank Rossii has been dipping into its $450 Billion stock of forex reserves, and selling foreign currency at the rate of $150 million per day. It insists that it will “allow” the Rouble to appreciate in 2011 in order to fight inflation, but that obviously depends on whether the current account shifts back to surplus. What do investors think? According to a Bloomberg survey of currency analyst, “The Ruble will strengthen 4 percent versus the basket by the end of the first quarter of 2011. On the other hand, “Options traders are still bearish on the ruble with the currency’s one-week risk reversal rate — the premium of put options over calls — at 1.25 percent for the tenth straight day, from 0.5 percent at the end of October.” Non-deliverable forward contracts, meanwhile, reflect a weaker Ruble three months from now. If the Bank Rosii fulfills analysts’ expectations and hikes rates in March, it will be step towards reinvigorating investor interest in Russia. More importantly, however, is that inflation is brought under control. Until that happens, the Ruble will remain the main standout in a sea of emerging market currencies that otherwise continues to outperform. Hi! I am fro Russia and I want to say, that our ruble will not going under 30 rubles per dollar, because our economic is very weak. President Obama needs to negotiate with the Russians on the START TREATY in exchange for this New Perpetual Motor Generator for the Electric CAR Industry !!!! The USA needs to Negotiate with Russia on the Start Treaty for control of this NEW TECHNOLOGY , because Giving up USA Nuclear Defenses must be worth this kind of technology to get The USA off Foreign OIL !!!!! With this Technology we can recharge our electric cars battery ON-the-GO and Not create More Demand on our current electric GRID . Everyone in the USA needs to call their Congress and demand this Technology be negotiated into the START TREATY with Russia so the USA can control this Technology for the New Electric Car Industry . President Obama needs to negotiate with the Russians on this and say if we are going to reduce our Nuclear Defense then we need full cooperation on integrating this Technology into the Electric Car Industry and whatever else we can find uses for this to reduce the Use of OIL so we ARE NOT FIGHTING OVER OIL ANY MORE IN THE WORLD !!!! TELL OPEC THEY CAN PRICE THEIR OIL IN WHATEVER CURRENCY THEY WANT , THAT THE USA WILL BE FINE WITHOUT IT !!!!!!!!! I had always been used to trading the usual pairs USDJPY. GBPUSD etc, I had never considered branching out into other pairs such as the rouble. Typically following the other sheep when it seems the gains are to be made else where! Will definately be reading more on this currency pair thanks to this post and looking to include it in my daily trading.